V-Weather Forecast: Victory parades in London and throughout Southern England on Saturday will enjoy bright sunny weather with no danger of any general rain, according to the Air Ministry experts today. Nearly 300 RAF planes, representing about 40 Squadrons, took part this afternoon in a full scale dress rehearsal of Saturday’s victory fly past over London. 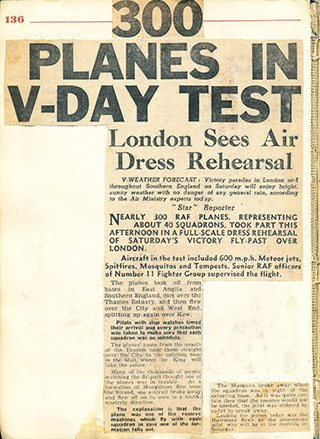 Aircraft in the test included 600 mph Meteor jets: Spitfires, Mosquitos and Tempests, Senior RAF officers of number 11 Fighter Group supervised the flight. The planes took off from bases in East Anglia and Southern England, met over the Thames Estuary and then flew over the City and West End, splitting up again over Kew. Pilots with stop watches timed their arrival and every precaution was taken to make sure that each squadron was on schedule. The planes’ route from the mouth of the Thames took them straight over the City to the saluting base in the Mall where the King will take the salute. Many of the thousands of people watching the fly past thought one of the planes was in trouble. As a formation of Mosquitoes flew over the Strand, one aircraft broke away and flew off on its own in a south westerly direction. The explanation is that the plane was one of the reserve machines which fly with each squadron in case one of the formation falls out. The Mosquito broke away when the squadron was in sight of the saluating base. 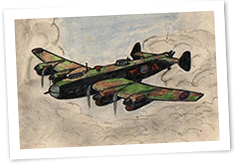 As it was quite certain then that the reserve would not be needed, the pilot was ordered by radar to break away. Leading the planes today was the Hurricane flown by the anonymous pilot who will be at the controls on Saturday.